You still remember what a BlackBerry L-series device is, right? It's supposed to be a BlackBerry 10 handset of the full-touchscreen type, instead of one with a physical QWERTY keyboard (yes, RIM is still planning to produce those). We've seen a few leaks of such an L-series device and we've mostly liked its prototype design. Now, we get to see a size comparison between it and the iPhone 5, as a brave individual has decided to the right thing and share this picture with the world. Interestingly, it turns out the BlackBerry handset isn't much bigger than the iPhone 5. What makes this interesting is that few smartphones nowadays aren't bigger than an iPhone. Anyways, the L phone is expected to pack a slightly larger screen, but we shouldn't forget that this handset is yer to become official. And considering that RIM has scheduled the official introduction of BB 10 for January, with devices probably coming even later, a lot of things about this handset might change until then. It may even be just a prototype that will never get mass-produced. All of this remains to be seen. Until then, we get the idea that it isn't RIM's intention to attack users with giant touchscreens. 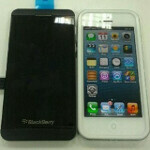 Is that a toy I'm seeing beside the bb10 L? its almost same in size, but you'll get bigger screen and the you ruled your phone! BlackBeery 10 is an awesome platform for all! you mean a lawsuit because the BB phone has a rectangular shape with rounded corners? or because it has a touch-screen? or because it looks almost the same that will probably confuse the consumer? Damn, I don't know how these companies manage to survive with apple suing everyone for everything. There's not gonna be a lawsuit. Apple only sues companies that sell lots of phones. Its practically edge to edge on the left and right sides. And the bezels on the top and bottom are smaller than the Iphone. This has a 4.5 inch screen on a marginally bigger overall footprint, so quite a good amount of the phone is screen real estate. I'm really curious to see how well these new BlackBerry handsets blend-in and/or hold up to such stiff competition from other companies such as Apple, Samsung, HTC, Nokia, etc. Though, there's one thing that I can say, for sure: RIM does not have it easy. I am quietly confident that the last thing RIM will ever do is put out a device that looks anything like an iphone. A pre-production model for a laugh possibly but not the real thing. In the styling department my 9860 makes an i5 look like a prep 5 glue and paste effort.